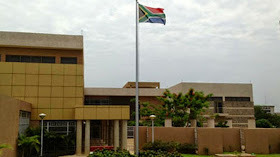 Following protests by Nigerians held outside the consulate and at the South African High Commission in Abuja against the Xenophobic attacks on foreigners in South Africa, the country on Wednesday announced the closure of its consulate in Lagos. South African Consul-General in Nigeria, Sam Monaisa, said this in a statement to the South African Business Forum that the closure would remain until Thursday. Although the situation in Durban has calmed down, he wrote that he was concerned about the Nigerians that were being repatriated. Also accused Nigerians of "using the social media to blow an already tensed situation in South Africa out of proportion and stoking emotions." Social media fuelling the belief that Nigerians were being killed daily in South Africa, has made South African businesses and citizens become targets of retaliation in Nigeria just as Johannesburg-based Sasol Ltd. announced it was repatriating South African employees working on projects in Mozambique for their own safety. He further warned the forum's members to stay alert and not move around unnecessarily. They should not be afraid,Nigerians do not pay back evil with evil.